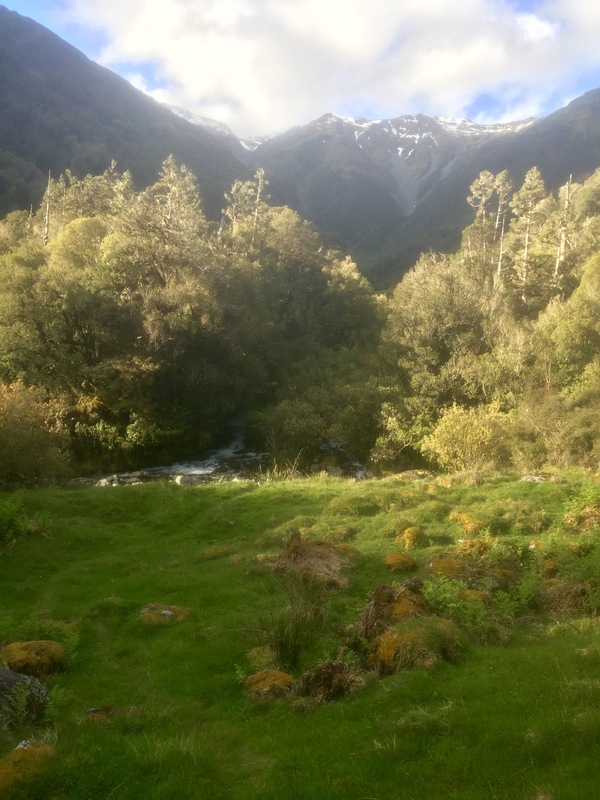 Woke several times in the night to rain on the hut roof, prompting anxiety that I would not be able to make it out of the river valley to the next section of the TA or to Arthur’s Pass village. As the morning’s hike progressed it was clear that there was no way I would be heading down the Mingha/Deception trail which is nothing but river crossings for 27 km. For all my insistence on liking to hike alone, I was exceedingly grateful to spend today with Alex and Courtney, who I’ve hiked near for three days. Two really smart and interesting trampers who are from US and Canada and have spent a good part of the last two years working in NZ given that there were numerous river crossings and decisions about where to hike — much of the trail is unmarked and proceeds down the river valley which is a landscape feature considerably different from North American counterparts. The rivers here braid over wide gravel valleys so at any given moment you may be walking on a fairly smooth gravel bed or right beside a raging torrent. We often had to cross rivers that were high and demanded care in crossing, something that increased in urgency as we descended and the river got deeper and wider. Our last crossing was the Otira toward the road where we could hitchhike to Arthur’s Pass. We had lock arms through pack straps and march across together– very deep, Alex was on downstream end and floated up a bit– but we made it, quite a thrill and a damn amazing experience. Looking forward to a hot shower and a hot meal and some dry clothes. I was picked up by a hunter who dropped me at the hostel where I did all those in-town things laundry, resupply, etc. while the rain poured down unmercifully.